A few weeks ago I confronted a blunt truth. I was addicted. To email. While working, every few minutes I would randomly click the Outlook Icon and check my inbox for unread mail. In the event that I saw the blue typeface signifying unread email, I just had to click on it. I couldn't help it. I would get the feeling that something was dancing in my brain if I closed Outlook without reading it. Of course - this significantly impacted my productivity - negatively. I would regularly quit priority tasks to attend to activities that were urgent, but not important. I tried everything. I removed Outlook from my task-bar. I would shut-down the program when I needed to focus on tasks. I would disconnect my computer from the internet, only to reconnect when I needed to get some information online / via Communicator...only to click on the new 'unread emails' once I saw them...only to begin the downward spiral again. Then I discovered Outlook's 'Work Offline' feature. I have not been more grateful for a software feature in years. When I activate 'Work Offline', I can focus on tasks for longer. 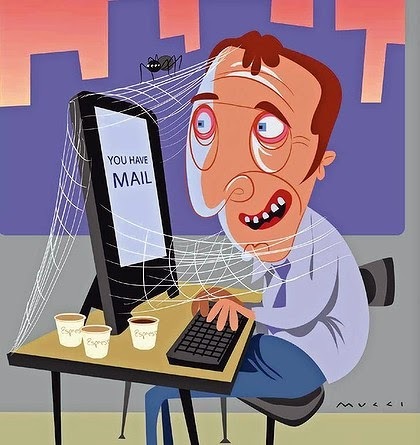 I can still access my old emails for information I may require - without any new emails coming in to distract me. I can also raise colleagues on Communicator when I need to get stuff from them. All of this without seeing any new email until I'm absolutely ready to OD on Email!!! That's one huge productivity problem solved!! !